Keywords: Adverse experiences; Childhood; Child; Adolescent; Health. Introduction: The adverse experiences in childhood and adolescence, as well as the exposure to domestic and school stress factors, can affect the health of children and adolescents. Considering that the education, health and security agents might not be aware of the problematic situations regarding children and adolescents, it is justifiable the investigation in that field. Objetives: To evaluate the psychometric properties, namely the factorial structure and the internal consistency, of the "Inventory of problematic situations involving children and adolescents" Methods: Study of descriptive nature, with transversal focus, analytical-correlational analysis and methodological correlation preformed of the "Inventory of problematic situations involving children and adolescents" on a sample of 136 education, health and security agents. Results: The internal inventory consistency study confirmed Cronbach's alphas, among the items that constitute it, classified as good, ranging from α = 0.791 to α = 0.822, with an overall alpha of 0.819. Their structure confirmed the presence of two factors: Factor 1 - Types of violence involving the child / adolescents in school context (α = 0.837) and Factor 2 - Risk factors for mental health (α = 0.639). The educational agents identified the highest risk factors for mental health in which a higher average was observed (M = 77.09 ± 25.72). 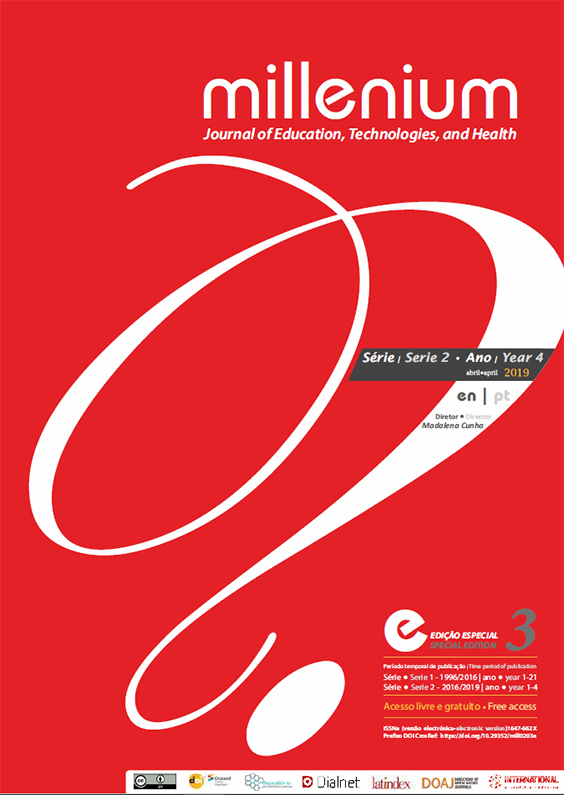 The study of the explanatory effect of socio-professional variables on the perception of problematic situations involving children and adolescents by educational agents reveals that age (Factor 2 - Mental health risk factors p = 0.015), marital status (types of violence that (p = 0.027) and the area of professional exercise (risk factors for the mental health of children and adolescents p = 0.008, types of violence involving the child / adolescents in the school context p = 0.018). statistical relevance. Conclusions: The results show that the "Inventory of problematic situations involving children and adolescents" presents a factorial structure with satisfactory results of validity and reliability, which results in the possibility of its application, as a research instrument, to evaluate the perceptions educational agents have problematic situations involving children and adolescents. Bento, A.de C. (2017). O programa Escola Segura: prevenção, proximidade e comunidade. Etnográfica, 21 (2), 319-339. Bethell, C.D., Newacheck, P., Hawes, E., & Halfon, N. (2014). Adverse childhood experiences: assessing their impact on health and school engagement and the mitigating role of resilience. Health Aff (Milwood); 33: 2106-15. Coutinho, C. P. (2014). Metodologia de Investigação em Ciências Sociais e Humanas: teoria e prática. Coimbra: Almedina. Cunha, M. (2017). Questionário ad hoc de caracterização socioprofissional . In Pereira, C. (Coord.) (2017). Projeto de Investigação Monitorização e avaliação dos indicadores de saúde mental das crianças e adolescentes: da investigação à prática. (“MAISaúde Mental” - Código de identificação:CENTRO-01-0145-FEDER-023293). Escola Superior de Saúde de Viseu, Portugal. Cunha, M., Duarte, J., André, S., Albuquerque, C., Aparício, G., Campos, S., Gonçalves, A., Madureira, A. & Andrade, A. (2017). Inventário de situações problemáticas envolvendo crianças e adolescentes. In Pereira, C. (Coord.) (2017). Projeto de Investigação Monitorização e avaliação dos indicadores de saúde mental das crianças e adolescentes: da investigação à prática. (“MAISaúde Mental” - Código de identificação:CENTRO-01-0145-FEDER-023293). Escola Superior de Saúde de Viseu, Portugal. Hughes, K, Bellis, M.A., Hardcastle, K.A., Sethi, D., Butchart, A., Mikton, C., Jones, L., Dunne, M.P. (2017). The effect of multiple adverse childhood experiences on health: a systematic review and meta-analysis, Lancet Public Health, 2: e356–66. Marôco, J. (2018). Análise Estatística com o SPSS STATISTICS. 7ª ed., 18-25. ReportNumber. Naicker, S.N., Norris, S.A., Mabaso, M., & Richter, L.M. (2017). An analysis of retrospective and repeat prospective reports of adverse childhood experiences from the South African Birth to Twenty Plus cohort. PLOS ONE, 26, 1-19. Oliveira, J.R. & Gomes, M. A. (2012). Bullying: reflexões sobre a violência no contexto escolar. Revista Educação por Escrito – PUCRS, 2:2. Pestana, M.H., & Gageiro, J.N. (2014) Análise de dados para ciências sociais: a complementaridade do SPSS. 6ª ed.. Lisboa: Edições Sílabo. Schneider, S.K., O'Donnell, L., & Coulter, A. (2016). Cyberbullying, School Bullying, and Psychological Distress: A Regional Census of High School Students. American Journal of Public Health. (102) 1:171-177. Stempel, H., Cox-Martin, M., Bronsert, M., Dickinson, L.M., & Allison, M.A. (2017). Chronic school absenteeism and the role of adverse childhood experiences. Acad Pediatr. ; 17: 837-843. Teicher, M.H., Samson, J.A., Anderson, C.M., & Ohashi, K. (2016). The effects of childhood maltreatment on brain structure, function and connectivity. Nat Rev Neurosci. ; 17: 652-666. Traub, F., & Boynton-Jarrett, R. (2017). Modifiable resilience factors to childhood adversity for clinical pediatric practice. Pediatrics. 139: e20162569. Wiehn, W., Hornberg, C., & Fischer, F. (2018). How adverse childhood experiences relate to single and multiple health risk behaviours in German public university students: a cross-sectional analysis. BMC Public Health, 18,1005. Wingenfield, K., Schäfer, I., Terfehr, K., Grabski, H., Driessen, M., Grabe, H., Löwe, B., & Spitzer, C. (2011). The reliable, valid and economic assessment of early traumatization: first psychometric characteristics of the German version of the adverse childhood experience questionnaire (ACE). Pschother Psychosom Med Psychol. ; 61:e10–4.